Where do I use my Pontins voucher code? Enter the start day of your holiday followed by how many nights you would like to stay. Before hitting search enter your code into the 'Offer Code' box and click use code. When hitting search your discount will be automatically updated and displayed in the price on the next page. Book early for low prices. Sign up to receive the regular newsletter to hear all the lastest discount codes and special offers. Pontins have been entertaining people for decades and have specialised themed breaks - music, dance, sport and special breaks. Whilst the holiday parks are great for families with many of the activities and entertainment being free they do offer special weekends/breaks for other types of holidaymakers; this includes adult-only breaks which are available at some of their parks. Pontins offer all holiday makers a choice of accommodation ranging from the “Popular” - fully fitted apartments that give good value for money, through “Classic” - usually situated closer to the central facilities, to “Club” - top of the range apartments, complete with added extras. Accommodation can be self-catering or half/full board, depending on your personal preferences and budget. Pontins offer an exclusive Kids Croc Club, which is full of fun and well loved by children and best of all give you the chance for a small break to relax in any way you would like. They offer weekend breaks, midweek breaks, as well as week, long breaks, the website is packed full of offers, deals are even available in the school holidays. The parks themselves are full of many free activities to keep people of all ages amused. There is always nightly entertainment from the famous Blue Coats and Pontins even offer entertainment breaks, with many different acts available to book and see. 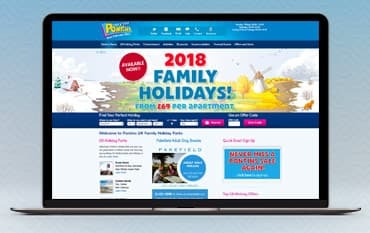 There are 6 Pontins Holiday Parks in the UK, these are listed below - at each park you will find the best live entertainment, delicious food, exciting activities and of course seaside air, a combination that makes for a great family holiday! Will we be able to park near our accommodation? You will be able to load and unload outside your accomodation, you will then need to park in a nearby designated parking area. There are disabled bays for blue badge holders. What documents will I need to bring with me to check in? You will need proof of identification such as passport, bank card, driving licence etc, alongside your balance paid voucher. Your check in time will depend on the type of accommodation that you have booked. Club apartments are from 2pm and Classic and Popular apartments are from 4pm. you can arrive on site anytime from 12pm and must check in before 10pm. Check out is by 10am on the day of departure. you will need to return your keys by this time, however you are welcome to stay on site after this time. Pontins is synonymous great holiday value and entertainment in the UK. With over 65 years experience in providing people with their perfect holiday, they’re the number one choice for many holidaymakers. Having been revamped in 2011 Pontins have 5 UK holiday parks throughout the UK. Southport in the North West, Prestatyn Sands in Wales, Brean Sands in the West Country, Pakefield in Suffolk and Camber Sands in Sussex. We are constantly on the hunt for Discount Codes for Pontins to help you with your money saving. Our experts check dozens of sites for secret codes including NHS discounts, student sites & social media channels saving you time & money!